The Home Office last week announced changes to the 'right to work' checks needed to avoid employing illegal workers. According to a Home Office press release on Friday, the changes will mean that employers can use the Government's online Employer Checking Service to demonstrate they conducted the necessary right to work checks. Immigration minister Caroline Nokes called it "another step we are taking to simplify and modernise the immigration system," and said it would make it easier than ever for migrants to view and prove their right to work in the UK. "The Government is committed to making it easier for lawful residents to demonstrate their right to work in the UK, and to strengthening the support we provide to employers when complying with the provisions in the Immigration Asylum and Nationality Act 2006 to avoid employing illegal workers. 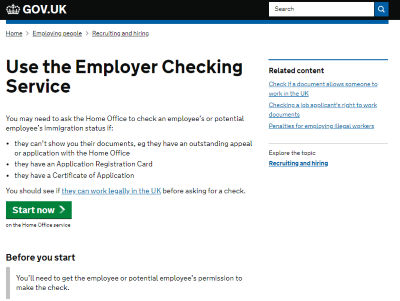 "In April this year, the Home Office launched a new online checking service. This service enables UK employers to check the current right to work, in real time, of a person who holds either a biometric residence permit or a biometric residence card, and to see whether they are subject to any restrictions. "The system works on the basis of the individual first viewing their own Home Office right to work record. They may then share this information with an employer if they wish, by providing their employer with a 'share code', which can be used to access the record. This authorisation represents an important safeguard and means employers will only view an individual's information having received their consent and the share code allowing their access. "We have worked closely with UK employers and with users of the service in developing this new system, which has been operating effectively to provide employers and migrants with additional assurance where used to support right to work checks. "In order for employers to actually rely on the new online service to discharge their legal responsibilities under illegal working legislation, it is necessary to amend the Immigration (Restrictions on Employment) Order 2007 to properly integrate the service into Home Office legislation which stipulates the checks employers should conduct to avoid a penalty for employing an illegal worker. These checks are currently largely predicated on a face value examination of a physical document. "Today we have laid before Parliament the 'Immigration (Restrictions on Employment) (Code of Practice and Miscellaneous Amendments) Order 2018, in accordance with the 2006 Act, together with a revised Code of practice, which provides that employers will be able to rely on an online check from the end of January 2019, where a prospective employee has an immigration status that is compatible with the online checking service (holders of biometric residence permits or cards, and those with online immigration status). "From the end of January 2019, employers will be able to request either the online check or the existing document-based check; online checks will therefore be a voluntary option whilst migrants and employers develop familiarity with the new service and take up becomes more prevalent. "The online checking service has also been developed to enable EU migrants granted leave to remain under the EU Settlement Scheme to view their status and to share it with employers and other service providers where appropriate. Current arrangements, under which EU citizens can demonstrate their right to work in the UK by producing their national passport or identity card, will continue after the UK leaves the European Union and for the entire duration of any implementation period. However, with the latest development, EU nationals may alternatively choose to rely on online status issued following a successful application to the EU Settlement Scheme, by using the online service to share their right to work with their employer. Further detail on the future immigration system will be set out in a White Paper shortly. "The Immigration (Restrictions on Employment) (Code of Practice and Miscellaneous Amendments) Order 2018 also seeks to amend the list of documents which demonstrate a right to work, to remove the requirement that a British birth or adoption certificate must be the full certificate for these purposes. The intention is to make it easier for British citizens who do not hold a passport to demonstrate their right to work, using a short birth or adoption certificate with a National Insurance number. "In addition to the Order, we have also laid the 'Licensing Act 2003 (Personal and Premises Licences) (Forms) (Amendment) Regulations 2018'. The regulations make consequential amendments to prescribed licence application forms to reflect changes to the Order. "Successive UK Governments have introduced measures to tackle illegal working which represents the principal pull factor for illegal immigration to the UK, and the 2018 Order underscores our commitment to improve the necessary system of checks for employers and workers alike. I would be happy to arrange a demonstration of the new online service for hon Members."